The Nutrimill Grain Mill is one of our most popular machines – it is at the top of its class! The Nutrimill features nearly 50% less noise than its competitors, as well as the 3xAirFlow ™- three times the air flow to all the right places – better stabilization, more strength, and faster, more efficient motor cooling. Nutrimill grinds wheat (both hard and soft), oats, rice, triticale, kamut, spelt, dried pinto beans, popcorn, split peas, buckwheat, barley, rye, millet, sorghum, dried mung beans and soybeans! 1:1 ratio for milling grain into flour: fill the hopper once and get a bowl full of fresh flour! Nutrimill can be turned on with grain already in the hopper, and can even be switched off and back on again with grain still in the milling chamber without plugging! 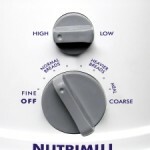 Lifetime Manufacturer’s Warranty: This great warranty includes the Nutrimill’s stainless steel milling heads!